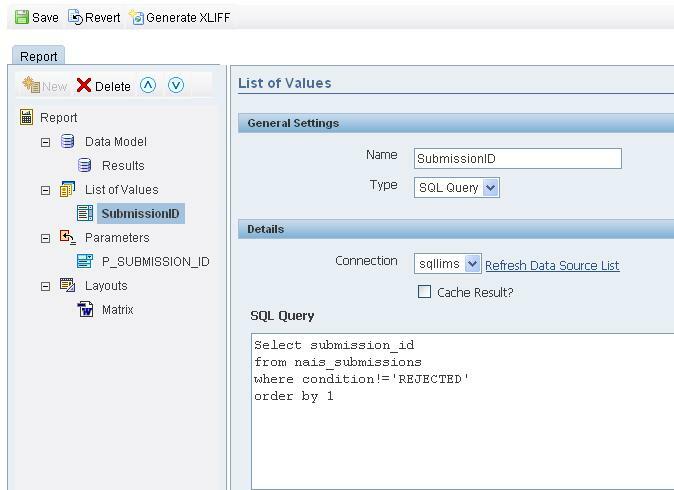 First create the query In the data modelwhich will retrieve the data for the X-column, Y-column and the grid cell. 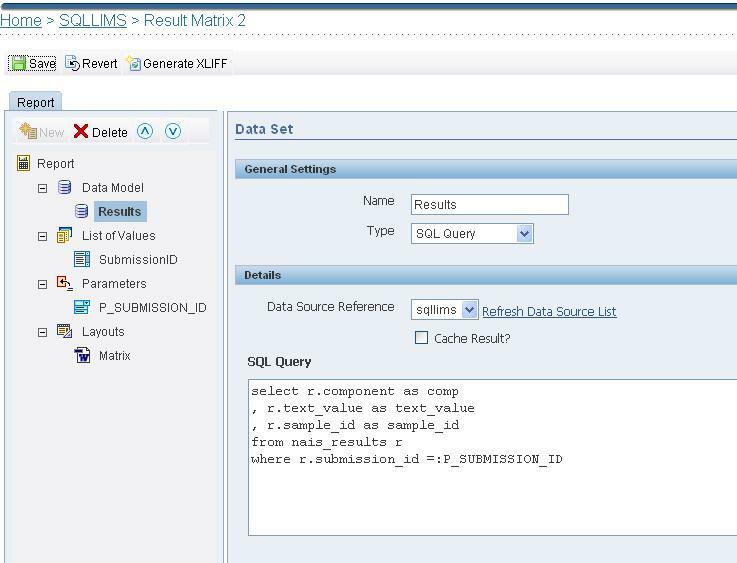 The most simple query will retrieve three columns. In my case I used the datamodel of one of my customers. Now I can define the parameter P_SUBMISSION_ID. The parameter will be of the type MENU so I can asign the list of values I created prior. We can now focus on the layout after we have exported the data from the view tab. We can load the data using the plugin XML-Publisher desktop created in MS Word. <?for-each-group@cell://ROW;./COMP?><?if:count(current-group()[SAMPLE_ID=$SAM_ID])?><?current-group()[SAMPLE_ID=$SAM_ID]/TEXT_VALUE?><?end if?><?end for-each-group?><?end for-each-group?> Note that again the fields in red are reference nodes in my XML output file and the field in green a declaration is of the parameter SAM_ID. This parameter is needed to determine if I need to populate a matrix cell. 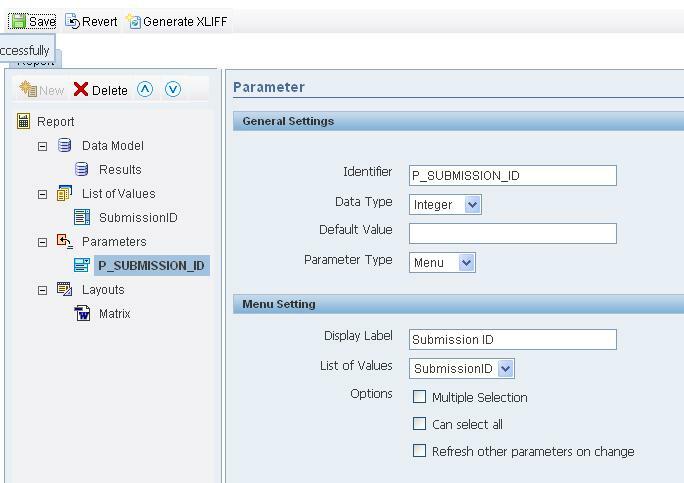 We create a group for each comp and check if the sample_id of this group is the same as the parameter SAM_ID. If this is the case than we display the text_value in the matrix cell. We close all groups and if statements with the proper tags. now we finished the layout and after saving the report and uploading the template you will be able to run it. Changing the layout of the matrx is easy now. We can change the cell size, table layout, colors and fonts in a blink. I need to build matrix report with 2 columns are repeating in group of Vendors. Excellent post. The 10.1.3.2 version of BI Publisher (new name of XML Publisher) has a drag-and-drop crosstab builder. This became generally available yesterday (http://www.oracle.com/corporate/press/2007_jan/012907-OBIEE.html) and should be available for download soon.